The eastern U.S. state of Tennessee is home to some world-famous music venues: the blues capital of Beale Street in the heart of Memphis, the Ryman Auditorium, often referred to as the Mother Church of Country Music, and the rolling hills of the Cumberland Plateau. 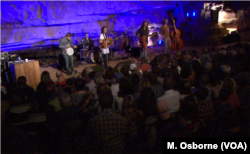 Actually, it's under the rolling hills of the Cumberland Plateau that you'll find one of the world’s most unusual performance spaces, Bluegrass Underground. On most Saturdays, between 500 and 600 music fans from all over the world trek nearly a kilometer into the Cumberland Caverns, and 110 meters down, to enjoy this original American music form. Under the limestone bedrock of middle Tennessee, you'll find some of North America’s most extensive cave systems and one of the world's most unusual performance spaces. 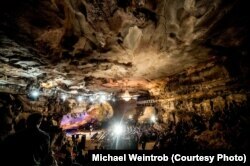 The performances are staged in a large cavern referred to as The Volcano Room. The room’s acoustics are nearly perfect. That fact was not lost on Todd Mayo, the Tennessee music promoter who originated the Bluegrass Underground in 2008. The shows in The Volcano Room feature artists playing so-called American Roots Music, developed by immigrants from the British Isles who settled in the hills above in the late 18th century. It is considered "roots" music because it served as the basis of music later developed in the United States, including rock and roll, contemporary folk music, rhythm and blues, and jazz. The Way Down Wanderers perform at Bluegrass Underground. On a recent Saturday, after performances by The Way Down Wanderers and Flatt Lonesome, bluegrass fan Gwynn Lanaus admitted he felt a bit queasy being so far underground, but also said the music seemed to fit the setting. Todd Mayo says he hopes in the near future to give music fans who attend the show an even fuller experience. He wants to develop a weekend long Tennessee experience that would include visiting some of the state’s many scenic parks and forests.